Along the Pacific Coast in Oregon and Washington States is the Lewis and Clark National Historical Park, which extends on either side of the mouth of the Columbia River. The Bicentennial of the Lewis and Clark Expedition had just been celebrated in December 2005, and there was renewed interest in that important journey they made across North America. Louisiana, then an area covering 830,000 square miles, had been bought by the Americans from the French, and President Thomas Jefferson wanted a route to the Pacific Ocean from the east coast. The expedition calling themselves the Corps of Discovery, set out along the Missouri River, and then across miles of unchartered territory, negotiating mountain ranges, daring wild animals and hostile native Indians. They covered 4000 miles in a year and half, and their last winter encampment before returning home, was Fort Clatsop. Here they stayed from December 1805 to March 1806. Fort Clatsop today is a famous tourist attraction. Though the original structure collapsed after the explorers went away, a replica of the log cabin was built in 1955. Unfortunately, it was burnt down in October 2005, and volunteers immediately rebuilt it in time for the Bicentennial. Set in acres of forest land, the smell of cedar wood as one enters the Fort is arresting. It is built of uniform logs placed one over the other, to form a sturdy stockade. The Visitors’ Centre adjacent to the Fort has a well documented history of the expedition. There is a striking cut-out of an Indian woman carrying a child. Clothed in her native colourful costume, a demure smile on her face, she stands there proudly, the acknowledged heroine of the expedition! She was the only woman in a group of 31 men. 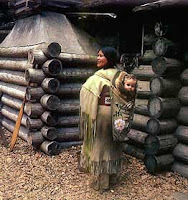 Sacagawea’s story is fascinating. It has been romanticised, fictionalised, and her contribution to the expedition has been debated by doubting Thomases. Yet the records of Lewis and Clark bear ample testimony to the fact that she was an indispensable member of the team. Sacagawea was born in the Shoshone tribe. At twelve, she was kidnapped by another Indian tribe called Hidatsa. She was bartered several times, and finally sold to a Canadian fur trader called Charbonneau, who made her his squaw. He then offered both their services as interpreters, to the Corps of Discovery. The girl was pregnant at that time, and later in their journey, was delivered of a boy, by Lewis who acted as midwife. Sacagawea had her work cut out. She pointed to various landmarks in her homeland of Montana and Idaho; she was interpreter between the Corps and the natives; she used diplomacy to negotiate safe travel through hostile Indian territory. Her crucial role was to procure horses for the expedition from the Indians. She also helped them identify edible roots and vegetables for food, and herbs for medicinal purposes. Though the Corps was heavily armed, the locals knew they came in peace, as they had a woman with a child in the group. Sacagawea was their ambassador of peace. During their travels, there was a sudden squall in which one of their boats capsized. It was carrying important documents, and this girl barely seventeen, retrieved their invaluable cargo from the water. Captains Lewis and Clarke were so grateful that they named a Montana stream after her, calling it Bird Woman River. When the expedition was about twenty miles from the Pacific Ocean, there was a debate as to whether they should set up camp at a place they named Dismal Nitch, or travel across the Columbia River to find a suitable site nearer the ocean. The matter was put to vote. Sacagawea not only claimed voting rights, she insisted on accompanying the party that would scout for a location. And so Fort Clatsop came into existence. They say that there are more memorials to Sacagawea than any other woman in American history. Lewis and Clark wrote much about this teenage girl’s courage, fortitude and resourcefulness.